Embraer stock sank again in 2016, but it's already bouncing back. New products arriving next year will offer even more upside. 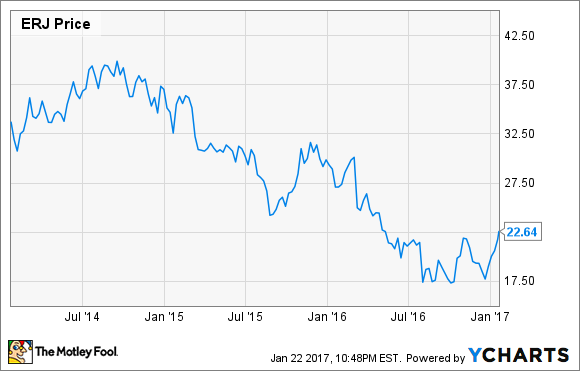 Embraer (NYSE:ERJ) stock wiped out during 2016 for the second consecutive year. Shares of the Brazilian aircraft manufacturer plunged 35% last year, according to data from S&P Global Market Intelligence. Embraer was dogged throughout the year by a weak market for business jets. Concerns about a downturn in commercial aircraft demand also weighed on the company. However, Embraer is working hard to reduce its cost structure, and it has important new products coming in 2018. This could help the stock rebound in the next few years. The biggest drag on Embraer's performance during 2016 was its executive jet segment. The global business jet market has never recovered from the Great Recession. On a conference call a few months ago, Embraer's management noted that the five main business jet manufacturers were on pace to deliver fewer than 700 business jets in 2016, down from 1,200 in 2008. In 2008, Embraer was just getting started in the executive jet business, with 36 deliveries for the full year. Since then, it has invested heavily in rolling out a full line of products. This has allowed Embraer to more than triple the size of its executive jet business despite the contraction of the overall market, with 117 deliveries last year. However, overproduction and a huge overhang of used business jets have undermined industry pricing. As a result, Embraer's executive aviation segment lost money in each of the first three quarters of 2016. Embraer's executive jet business hasn't been profitable lately. Image source: Embraer. Embraer's defense business also continued to struggle in 2016. While revenue has stabilized after being hit hard during 2015 by budget cuts in Brazil and the depreciation of the real, the defense segment is still barely profitable. Meanwhile, Embraer's commercial aviation business posted mixed results last year. On one hand, Embraer delivered 108 commercial jets in 2016, up from 101 a year earlier. On the other hand, the company's firm order backlog for commercial jets plunged by more than 10% -- from 513 units to 450 units -- during 2016. Finally, Embraer had to agree to pay more than $200 million to settle a long-running bribery probe instigated by the U.S. government. More importantly, the outlook for the next few years is much brighter. In late 2016, Embraer implemented a $200 million cost-cutting program. After the effects of inflation, management expects this program to boost earnings by $100 million in 2017. Embraer has also shifted its focus in the executive jet business from gaining market share to maximizing its profit margin. In light of the company's strong positioning in the market, this should lead to significantly improved profitability. Additionally, Embraer has important new products in the pipeline. Embraer's new E2-series commercial jets began flight testing last year and will enter into service beginning in early 2018. The new models will be 16%-24% more fuel efficient than the current-generation E-Jets, while offering other enhancements like larger overhead bins. Embraer's next-generation commercial jets have begun flight testing. Image source: Embraer. Embraer already has 275 firm orders for the E2-series jets, with hundreds of additional options, purchase rights, and commitments. It could get another lift this year from new Chinese government policies designed to stimulate the regional aviation market. Deliveries of Embraer's KC-390 military tanker-transport plane are also set to begin in 2018. This is the largest plane Embraer has ever built. The Brazilian Air Force has ordered 28 KC-390s, and Embraer has seen plenty of interest from international customers as well. A year later, Embraer will deliver the first of 36 Gripen NG fighters to the Brazilian Air Force. The KC-390 and Gripen programs should drive a return to strong growth in Embraer's defense business starting in 2018. For 2017, there's no clear consensus about how Embraer will perform. Analysts' earnings per share estimates range from a low of $0.93 to a high of $2.85. Based on the average estimate of $1.81, Embraer stock trades for less than 13 times earnings despite rallying about 20% in the first three weeks of the year. Even if Embraer falls short of that estimate this year, it has ample earnings growth potential as it rolls out a slew of new products -- which should command better pricing -- in 2018 and 2019. Patient investors who hold on to Embraer shares for the next few years are likely to be well rewarded. 3 International Companies Making Waves in the U.S.